Welcome! We are delighted that you are visiting our web site as well as our parish. We hope you can worship with us and we welcome you to become registered. 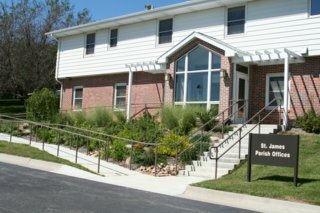 Please call us at the Parish Offices, 402-572-0499, with any questions you have. The people of St. James Church are glad you are visiting us. If you are interested in becoming a member of our parish, there is a three step registration process. We invite you to be registered in order to celebrate the Sacraments, receive parish rates in the school and the PRE program, to rent the Parish Center and other benefits. If you aren't receiving parish mailings, you may not be registered. First, we'd like you to call the Parish Offices to give us your registration information or just stop by, Monday through Friday from 8:30 am to 5:00 pm. Next, we'll send you a letter with the upcoming dates for new parishioner orientation. These meetings occur once a month and alternate between 10:30 am on Sundays and 7:00 pm on Tuesdays. At the orientation, we'll have lots of information for you, answer any questions you have, and give you an opportunity to finalize your registration. When you sign and return the Membership Agreement, you complete the registration process. To begin registration call the Parish Offices, 402-572-0499, with the information. "Love one another, as I have loved you."